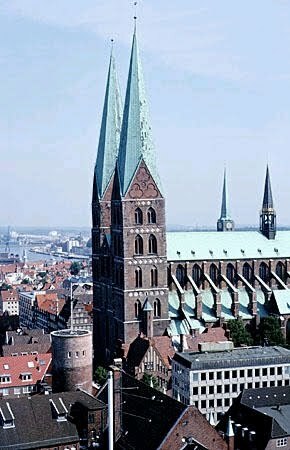 St. Mary's Church (Marienkirche) was commissioned by the Council of Lübeck, and competed with the Cathedral, which was founded by Duke Heinrich and later became the church of the bishop. It replaced an older Romanesque church (which in its turn replaced the first wooden construction from 1160). Surrounded by houses and the Town Hall, St. Mary's Church is imposing from the outside - albeit you have to crane your neck back to see most of it - yet more so from the inside. It is a basilica with three naves and a choir; the middle nave being higher than the side naves so that light streams in from the windows, as you can see on the pic (which also shows the flying buttresses). The church is made of brick stones, but inside it is mostly painted in white; the edges of the pillar-supported arcs that hold the elaborate roof construction, are painted with red, dark green and golden ornaments. (Photo below). The first impression, especially on a sunny day, is the brightness of the inside, and the enormous height of the naves (main nave 38.5 metres). The naves are separated by rows of pillars to hold the arched roof segments, the arcs are not perfect half-rounds, but slightly pointed (typical for the Gothic style), and the pillars are very slender, which adds to the impression of height and makes you feel like you are walking though a white alley of stone. With a length of 104 metres and a bredth of 58 metres, the church can well compete with its models, the great 13th century French cathedrals, While St. Mary's Church in the present form was built from 1251 onwards with the last finishing touches added about 1310, the simple ornaments are more like the older churches, not like the maginificent facades of fe. York Minster. The strive for greater symmetry between parts of a building and the building in its entity, between the interior and the outside, led to the development of the Gothic style. It began in France (fe. St. Denis 1130-44, Laon 1160-1205) and reached a fist peak in the cathedrals of Chartres and Reims (1211-41). From there it made its way to England (Canterbury, Westminster), Germany (Strasbourg, Cologne) and Spain (Burges, Toledo). The style was further enhanced in the reconstruction of St.Denis (1231-41) and Troyes (ca 1240). About 1350, the very ornamental style flamboyant, or perpendicular style came into use. Those who have read Eco's The Name of the Rose might remember some of the Mediaeval philosophy / theology about the way to see the things of this world as signs for something greater. Thus, every church was a symbol for the Holy Jerusalem and the Temple of Salomo, and it was a token of the faith of the people. The ecclesia materialis, the stone-made cathedral, stands for the ecclesia spiritualis, which is built again and again by the living bodies of the Christians gathering in the churches. The room enclosed by the church walls becomes a place not of this world, but a space where the soul by contemplation can reach the higher meanings of faith, a door to Heaven. For people who often could not read, the frescoes, altars, crucifixes, the figures carved in wood and hewn in stone, told the story of the Old Testament and the Gospel. Beauty in Mediaeval times was defined by completeness, harmony and light / colour. After new techniques had been achieved which made it possible to leave more space between the supporting parts of architecture like walls, columns and arcs, the churches became brighter because of larger windows, and the slender pillars gave an additional feeling of space. There is indeed something to Mediaeval beauty: I always feel a sense of peace when I visit old churches (and I'm not a religious person). I suppose it is due to the harmony. Nowadays, many of the churches a painted white with only a few ornaments, but in Mediaeval times - already during the Romanesque phase - the walls were adorned with frescoes. These have often been lost, but I have seen a few churches were some of them are left. The same goes for the windows which were made of mulitcoloured glass, showing Biblical scenes. They often have been replaced by either simple glass windows, though bulls' eye-style, or with modern painted glass, which sometimes suits well, but sometimes not. The time when the Gothic style developed (ca 1140 - 1260), was a time of change. New building techniques were achieved, the population increased because of better agriculture, the first steps towards natural science were done, new ways of idealised courtly life developed. The feudal system and with it the power structures also underwent considerable changes, and the towns gained in importance, as I have already explained in my post about the Hansa. Because of that, there was also an - mostly unacknowledged - element of competition in commissioning new and larger churches. As I said, I was impressed by the size of the St. Mary, and by the light - maybe even more than when I visited it for the first time, and I almost forgot that most of St. Mary's Church is a reconstruction. The building had been severely damaged in 1942 and most of the valuable equipping was lost. The two large bells fell straight down from the tower and crashed to pieces on the flagstones. The shattered bells have been left as a memorial. When we first visited the place, my father, who had experienced bomb terror in Braunschweig, told about the war and the airborne attacks. The simple symbolism of the broken bells in an else perfectly reconstructed church made me cry then, and it made me weep again this time. The pictures were scanned from postcards I bought in Lübeck. My visit to the town happened pre-digital camera times..